There are No Exceptions, except for our local sign-maker. jesus luvs smert peeple! Let all us prey fo big smarts! Holy seperation of church and state, Batman! Athletics is also spelled wrong. 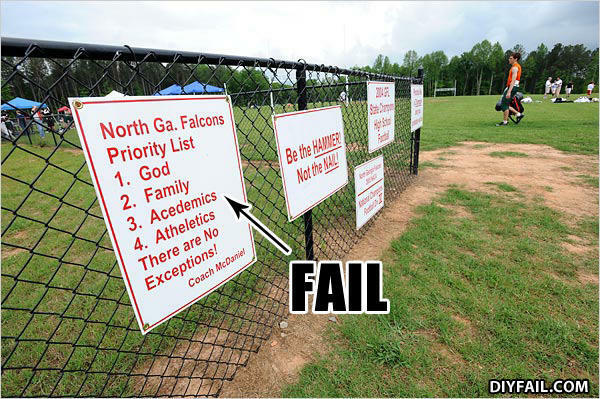 The biggest "Fail" here is not just that someone paid for and displayed a sign with two spelling errors (Acedemics and Atheletics for those with an American education) but also the fact that this sign clearly demonstrates discrimination toward atheists. One also notes that Coach McDaniel places honour and other virtues below "Atheletics". Nice standards douche-bag. What's the bet he'd forget all these supposed standards for a decent quarterback?